In Britain we are rightly proud of our shooting sports. Game management and conservation help shape and enhance our landscape. Wildlife thrives where land is managed for shooting. Over a million people are involved in shooting; many more enjoy the end product as consumers of pheasants, partridges and other game. Moreover, shooting makes a substantial contribution to the rural economy – often at times and in places where other income is scarce. Shooting is worth £2 billion to the UK annually. But shooting has its opponents; the good name of shooting – and the ability of our organisations to defend it – depends on everyone involved following this Code. 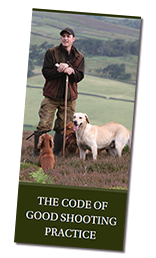 Whatever your role within shooting, you should always be ‘Code-aware’ and raise awareness of this Code in others. Click here to download the Code of Good Shooting Practice - PDF - 2.5mb. If you have any valid concerns about how a shoot is organised or require further information then please click here to contact us.